One of the most popular requests I get from my brides and grooms is to take lots of "details" photographs. I know from experience that my wedding couples spend a lot of time, energy and money on all the little touches that make up the essence of their big day. Everything from the stationery they choose for their save-the-date cards, invitations, programs and menus to the linens they choose for the decor of their reception hall. Bridal bouquets, the gentlemen’s boutonnieres, corsages, altar flowers and dining room centerpieces all get careful consideration. Favors for your guests and gifts for your bridal party members all say a lot about you. You will be choosing a unique wedding gown, dresses for your bridesmaids and formal wear for the groom and his ushers. You will carefully plan your menu with your caterer for your cocktail hour and reception and will pick out the perfect wedding cake. You may need limousines to get around and maybe even a bus to transport your guests from their lodging to the ceremony and reception. The list is endless and at the end of the wedding day they are gone forever...except for the professional photographs.I try to capture even the smallest of details in the most creative way possible. Notice, in this picture, how the beam of light falls gently across the wedding invitation and highlights the bride’s beautiful engagement ring so naturally. 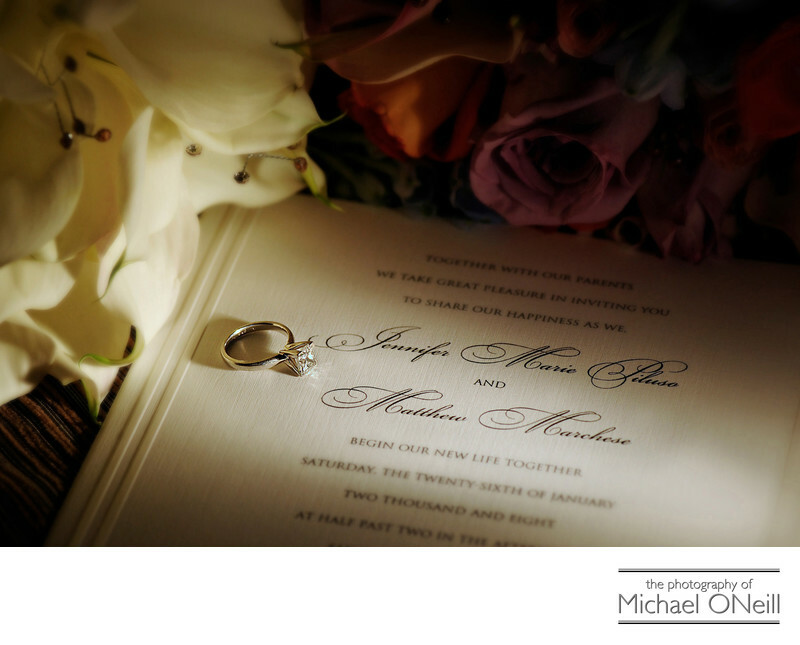 I would love to meet with you at my East Northport, NY studio and gallery and show you many more examples of the way in which I will elegantly photograph all the special details of your wedding. Give me a call and we’ll set up a time to get together.